After losing contact to the Protectors of Concord Dawn, Sabine, Ezra and Fenn Rau investigate. They quickly discover that Imperial Mandalorians have taken over the station. 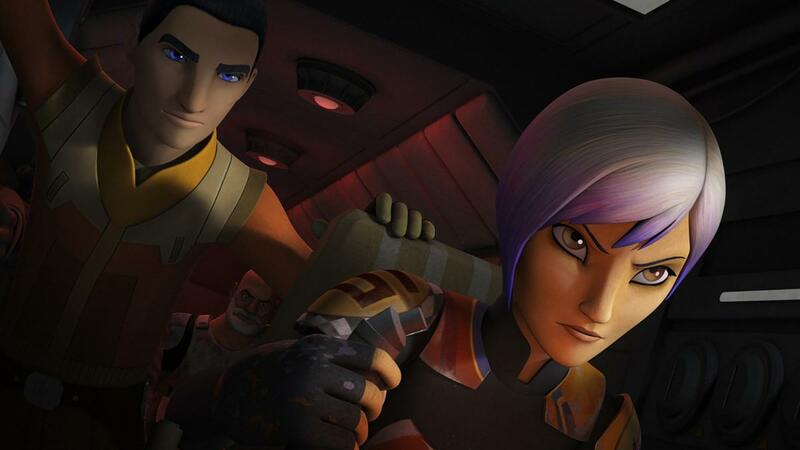 Ezra and Sabine join forces to subdue a young pilot ace and his crew, who are foolishly risking their lives. That is the only way they can defend their home. The Rebels join forces with ruthless pirates to salvage a freighter full of weapons the Rebellion needs. However, the mission turns out way more dangerous than they expected. Looking for information on a new Imperial weapon, Ezra and Kanan break into an Imperial factory on Lothal. However, they have to trust an enemy to escape from a building that is about to be locked down. Haunted by visions of Maul, Ezra has to journey across the galaxy. Upon arriving at his destination, he has to participate in a strange ritual to sever his connection to Maul. These are all very exciting! The extra focus on Ezra and Sabine and the eventual return of Maul sounds intriguing. Star Wars Rebels will return next Saturday, November 5th, at 8:30pm ET/PT on Disney XD! They should make more episodes with Rex!